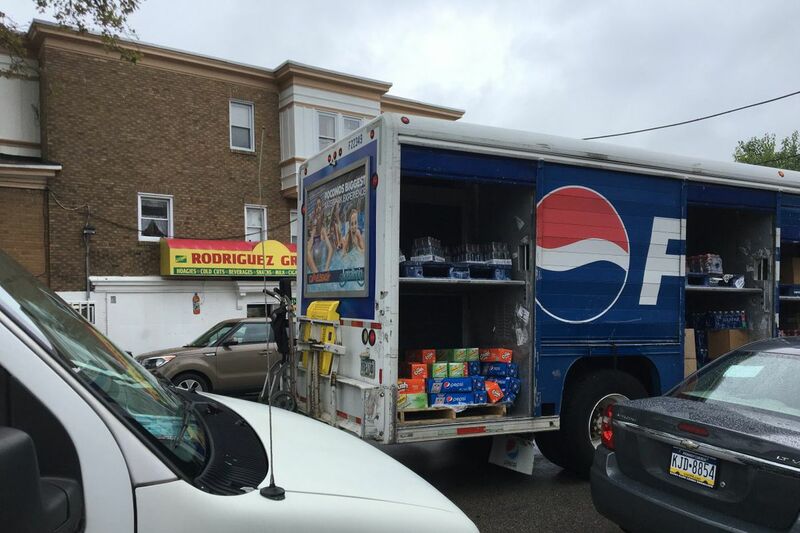 A Pepsi truck delivers soda to Rodriguez Grocery in Overbrook. The store got two deliveries per month before Philadelphia’s tax on sugary drinks went into effect, said cashier Irene Rodriguez. Now, the corner store gets just one delivery per month. Michael Solomon is a regular for hoagies at Bruno's Pizza on Cheltenham Avenue. He also loves soda. But since Philadelphia's tax on sweetened beverages went into effect, the 33-year-old West Oak Lane man has stopped buying soda with his sandwich. Instead he crosses the street and hits the Fresh Grocer, where he can get a two-liter bottle for as little as 88 cents, about a third what it costs in the city. "People around this area will just go to the market over there," Solomon said one afternoon last week, pointing to the other side of Cheltenham Avenue as he stood at Bruno's waiting for a hoagie. Solomon is not the only one to cross the city boundary to avoid the 1.5-cent-per-ounce tax, according to a report released Tuesday. Catalina, a Florida-based digital marketing firm, said its review of sales data from nearly 1,000 stores in the region found soda at franchised grocery and drug stores dropped 55 percent inside the city after the tax went into effect this year, while sales spiked by 38 percent at stores just outside the border. "Many shoppers are now traveling outside the city to buy their sweetened beverages," the report concluded. A city spokesman was skeptical of the findings. The marketing company presents itself as a neutral player, but does partner with retailers. Still, the study is likely to represent the latest ember to stoke the still-raging battle between city officials and the beverage industry over Philadelphia's groundbreaking levy on sugary drinks. Nearly eight months since it went into effect, the tax remains a hot topic in political and economic circles, and has stirred debates over whether cities can and should tax unhealthy behavior. The tax has survived court challenges thus far, but both sides are waiting to hear whether the Pennsylvania Supreme Court will take up the issue. And the rest of the country is watching as other government bodies consider or implement similar taxes. Chicago and its surrounding region imposed a similar levy this summer. Catalina calls itself an independent third party with no stake in Philadelphia's tax on sugary beverages. It said it tracked sugary-drink sales through its existing database of shopper data and behaviors at stores around the Philadelphia region. A spokesman said the study of soda sales was not commissioned by any of its clients. "The sugar tax is a hotly debated topic, and, while Catalina remains neutral, the company is in a position to provide a factual account of the purchase behaviors that occurred in Philadelphia after the sugar tax took effect," the company said in a statement. The city has been quick to point out the tax's benefits. Levied on distributors, the tax raised $39.3 million in its first six months, said Mike Dunn, a spokesman for Mayor Kenney. That figure is below the $42.6 million city officials had initially projected, but just short of the revised $39.7 million it announced in June. Going forward, they hope to raise an average of $7.7 million per month, with the money going for expanded prekindergarten, community schools, parks, recreation centers, and libraries, as well as other budget programs. Though the details had not been released, Dunn said the mayor's office had doubts about the Catalina study. Supermarkets account for less than half of beverage sales in Philadelphia, he said. If sales had decreased 55 percent across the city, as the report suggests, the tax could not have brought in the revenue that it has to this point. The study also did not include restaurants, institutions such as universities and hospitals, and non-supermarket stores, which Dunn said account for the majority of the city's sugary-beverage sales. "While we think Catalina is dramatically overstating the drop, we would expect that retail sales would be down in the first few months of the tax because initially people are upset and drive over the city line," Dunn wrote in a statement, "but then they do the math and realize the cost of gas or the pure inconvenience doesn't make it worth it." But some retailers in Philadelphia — particularly those near the border — say sales have suffered in the last several months. "The people buy mostly 100 percent juice now," said Irene Rodriguez, a cashier at Rodriguez Grocery at 56th and Berks Streets in Overbrook. She said the store used to get two soda deliveries a month, but now the Pepsi truck comes just once – and with a smaller shipment than ever. Customers still come in, she said, but not as many as last year. And they complain about the soda prices. "They're surprised. They say, 'That's crazy,' and they put it back," Rodriguez said. Pepsi, Coca-Cola, and Canada Dry have all reported job losses in the Philadelphia area that they blamed on the new tax. Catalina said its study looked at sales in four areas: 45 stores in the "Philly core," or center of the city; 76 stores just inside the border; 66 stores just outside the city; and 789 stores farther outside the city. The company also tracked sales of other beverages affected by the tax. Energy-drink sales decreased 7 percent in the "Philly core" in the first five months of this year compared with the first five months of 2017 and decreased 13 percent just inside the city border. Just outside the city border, energy drink sales increased 6 percent. Chris Stamoulis (left) and Gus Bouikidis prepare for lunch orders at City Line Pizza, where employees say sales have not decreased since Philadelphia’s tax on soda and other sweetened beverages went into effect this year. Sports-drinks sales decreased 44 percent in the city, and increased 25 percent just outside it. Ready-to-drink coffee and tea sales decreased 37 percent in the "Philly core" and increased 24 percent just outside the border. Juices that contain more than 50 percent juice are not taxed, but Catalina found that sales are slightly down — by 4 percent in the core of the city — "perhaps because shoppers incorrectly believe these juices are also taxed." While sales of taxed beverages decreased, Catalina found that sales increased for another product: bottled water. The report found that inside the city, bottled water sales increased 13 percent in the six weeks after the tax went into effect. Anthony Campisi, a spokesman for Ax the Beverage Tax campaign, backed by the American Beverage Association, said the study's findings appeared to match the association's arguments against the tax. "We've seen time and time again that this tax has had a really bad, negative impact on essentially the economic engine with Philadelphia neighborhoods," he said. Yet some say business has not been affected. Cashiers at gas stations on the Philadelphia side of City Avenue said last week that — despite lower soda prices at competitors across the border — they have not seen a substantial decrease in sugary-drink sales. And Rich Smith, executive vice president of operations at City Line Pizza, less than a block from the city's boundary, said customers still buy soda. "I don't see a difference," he said, as he prepared a Tuesday lunch order that included four two-liter bottles of soda. At Bruno's, where Solomon said he no longer buys soda, a man working behind the counter had a blunt response when asked about the tax. "We don't like it," he said. "It's bad for business."